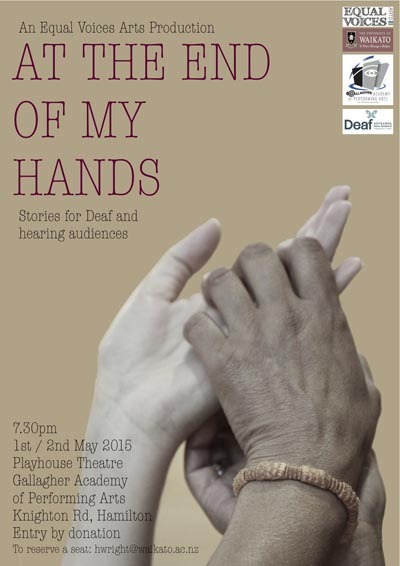 A short theatre work that includes Deaf and hearing performers, using both New Zealand Sign Language and spoken English on stage, will be performed at the Playhouse Theatre at the Gallagher Academy of Performing Arts on 1 and 2 May in Hamilton. The facilitator of the work, entitled At the End of my Hands, is Dr Laura Haughey. A theatre director, choreographer, movement director, performer and workshop leader, she came to Hamilton from the UK in January 2014 to take up a lecturing role in theatre studies at the University of Waikato. Laura has had many years’ experience producing ensemble theatre work with a Deaf-led sign dance theatre company in the UK called Common Ground. She also set up a multi-arts company called Equal Voices, which has been running for more than ten years in the UK. Now operating in both New Zealand and the UK, its artists and practitioners undertake performances, workshops and training with disabled and non-disabled people. The short theatre work will be accessible to both hearing and Deaf audiences without the need for sign interpreters. Laura held three workshops to explore physical storytelling and “sign theatre” over February and March to see if there was interest in the project. Staff from Deaf Aotearoa in Hamilton offered support and guidance with these initial sessions. "There was a great response to the workshops," Laura says. "The 15 people who participated were up for having a laugh, and were talented and open. They were encouraging and super-patient with me because I sign with British Sign Language, not NZSL. Laura says that sign theatre explores the ways that Sign Language can inspire action, choreography and other theatrical possibilities, and combines Sign Language and English without the need for sign interpretation. "I particularly like working alongside Deaf performers because they're such natural storytellers and they inherently understand that performance is centred around the body," Laura says. “I have worked with a dance theatre company and have a background in physiotherapy so everything I do is quite physical in nature. 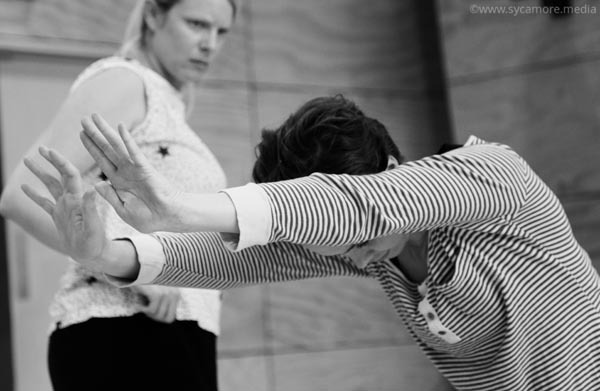 "My aim with this project is to raise the profile of NZSL in theatre,” Laura says. “It's one of the official languages in New Zealand and I hope audiences will see its creative potential. The actors have devised the show with the help of Alex Lodge, the project's dramaturg. Bill Hopkinson, a writer and an award-winning dramaturg from the UK, will also be there in an advisory role. The role of Alex as dramaturg is to offer and receive ideas, inspiration and starting points for and from the performers, and to help shape the narrative journey for the piece. This performance project has been funded by the Faculty of Arts and Social Sciences Contestable Research Fund from the University of Waikato. Photos courtesy of www.sycamore.media The Playhouse Theatre is in the Gallagher Academy of Performing Arts, University of Waikato, Gate 2B Knighton Road, Hamilton. The performances are at 7.30pm 1 and 2May , with an interpreted Q&A after the performance on 1May. To reserve a seat, email hwright@waikato.ac.nz. Original generation time 1.8333 seconds. Cache Loaded in: 0.0005 seconds.